Shropshire Garden Design also trades as Shropshire Aquatics. This web page provides a brief summary of our services but for more information see our dedicated website at www.shropshireaquatics.co.uk. Whether you are looking for a new garden pond, renovation of an existing pond, pond cleaning services or installation of a new water feature, we can provide expert help and advice. Are you looking for a wildlife pond or a fishpond? Wildlife ponds are generally shallow and bowl shaped will marginal shelves for planting. 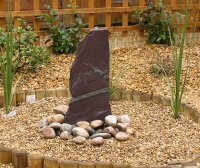 This will attract frogs, newts and birds and can be built to blend in with the existing environment of the garden using natural stone such as sandstone. Fish ponds are generally deeper with near vertical sides and deep marginal shelves to detract herons. Unlike wildlife ponds, fish ponds can if you wish adopt a more formal design by using brick or sleepers. This allows you to raise the pond to whatever height is required. For specialist Koi ponds, we recommend a minimum depth of 3', little or no planting, and a more specialist filtration system will be required depending on the number and size of fish required. Regarding the choice of fish, there are hundreds of different varieties of Koi alone but typical other fish introduced into garden ponds are goldfish, shabumkins and tench. We can provide fish from local suppliers at competitive prices. 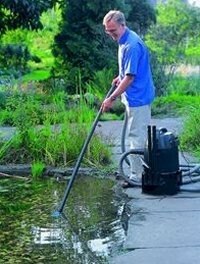 We can also provide expert advice on pond equipment and maintenance and fish health in association with our colleagues at Ripples Waterlife, Stafford Park, Telford. We have built everything from a 2 square metre aquatics wildlife pool to a 36 square metre Koi pond. Whatever size or shape you require we can offer the expertise required to build your aquatics pond. We can help you choose pond liners, pumps, filters, UV lights, pond heaters, pond lighting, and even the fish. Please note that if you have pets and/or small children we need to consider whether it will be practical or safe to have access to open water. If you already have a pond we also regularly carry out pond renovation work, replenishing worn liners and pipes, and replacing old pumps and filters. We have specialist equipment including pond-cleaning vacuums, spare pumps and filters, holding tanks and everything necessary to ensure your fish are kept safe and well whilst renovation or cleaning work is carried out. If your pond is over 10 years old and does not have a concrete liner then the chances are that the membrane or liner used is warped and could result in your pond losing water. Depending on your pond size, we can normally relocate your fish to a aquatics holding tank, drain the pool, install a new liner, refill the pond and return the fish in the same day. Most garden ponds are emptied and thoroughly cleaned twice a year. Ponds are cleaned after winter to clean out any dead matter in the pond, replenish fish stocks and plant any new marginals. The pond is normally then cleaned again at the end of the summer, clearing any algae and blanket weed. We can usually empty, thoroughly clean and refill most ponds in the same day. 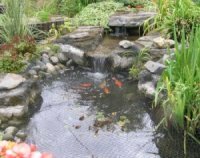 If you don't have room for a pond or have small children, a stand-alone aquatics water feature may be a more suitable option for your garden. 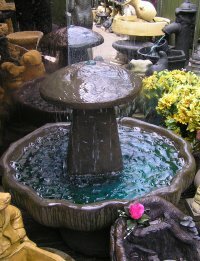 Everyone it seems is keen to have some form of water feature in his or her garden and it is not hard to see why. There is something very special about having still or running water in the garden. Water is very relaxing and there is nothing like the sound of water to relax you in the garden after a hard day at work. 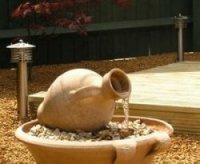 If you are simply looking for a self-contained water feature there is a massive range of water features in stone, hardened plastics, PVC and timber. The size and style of the aquatics water feature should be considered in relation to the size of the garden it is to go into. 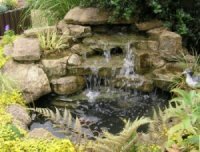 As well as sourcing the best prices for water features for you, we can if you prefer, build water features and rockeries to suit a particular garden style. 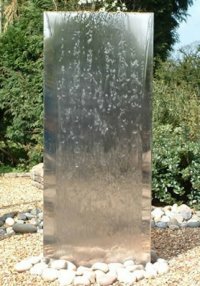 Whatever you choose, we can supply and install any type of water feature. Click here to see examples of our latest work.